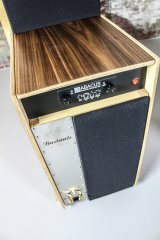 The top of the line Bastanis speakers! Is it possible to make the best speakers even better? After a more than a decade open baffle speakers at the leading edge starting with the Prometheus speakers followed by the Mandala speakers, constant evolution, hundreds of satisfied customers all over the planet, raving reviews and reviewers who tend to keep the Bastanis speakers we are proud to invent the new Bastanis Sagarmatha open baffle speakers. Sagarmatha is the sanskrit name of the highest mountain on earth, the name equals the absolute sound quality which is lifted a full step ahead to a paramount level. 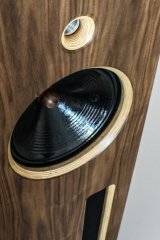 There is a new generation Gemini dipole tweeters, a new generation 12“ AlNiCo wideband drivers, the 18“ Ultimate dipole woofers and new German made woofer- amps. 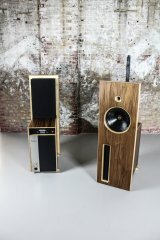 The resulting soundquality is breathtaking and will open new perspectives even when you listen music with famous big historical horn- speakers believing that progress in developing the quality of speakers stopped many decades ago. There is a Sagarmatha Solo version with one 12“ AlNiCo wideband driver, one Gemini MKII dipole tweeter and one 18“ active powered Ultimate dipole woofer each side. The Sagarmatha Solo speakers are compact sized and they don`t require big free space around the baffles to show best sound quality. The Sagarmatha Solo speakers are made for room- spaces from about 25 square meters up and integrate well in most interior designs. We made the look more elegant all around compared to the previous models and the Bastanis Sagarmatha Solo speakers come with backside- covers and optional front- covers. 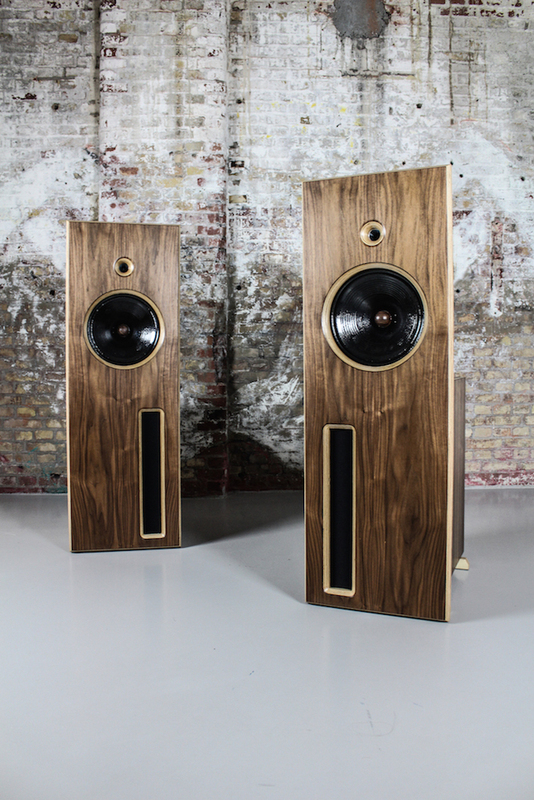 The look and finish all are custom- made to your wishes, many options are possible and it`s normal for us to listen to your wishes and built the speakers exactly the way you like. There is no series- production and the custom production requires a waiting- time of about three month which may extend if there are many orders. Bastanis speakers also are available from some dealers who are licensed to built cabinets and assemble the speakers to the same quality standards as the German made Bastanis speakers. 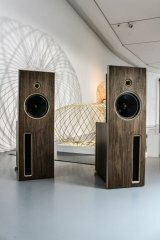 This is a big plus because you have local woodwork, the path of communication is more direct and the prices for custom made speakers is much lower compared to overseas- shipping of German assembled speakers. The Sagarmatha Solo speakers have been reviewed recently by Clive Meakins at Enjoy The Music. 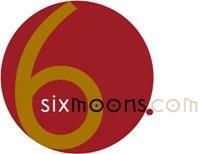 CLick here to read the complete review. "I'm thinking double bass in particular; that said the likes of "Man Machine" by Kraftwerk pressurizes the room with sound waves and is deeply impressive so electronic music works well too. Both macro and micro dynamics are impressive; I noticed is that a change of pace from musicians is very easily detected. Clean, natural and believable are words that come to mind when trying to characterize the Sagarmatha Solo. By „ elievable“ what I mean is the sound is a good illusion of live music, the scale and presence make you feel there's band in the room – providing the source, source material and amplification are up to it." After spending hundreds of hours with the Bastanis Mandala, I can honestly say that they do many things better than any speakers I have ever heard. Foremost among these qualities is that they are highly expressive and produce a very involving nuanced sound. They project a large soundstage with great depth and bloom at even moderate levels. When called upon, they will startle you with dynamic impact. They will do justice to all kinds of music as one would expect from a truly full-range speaker - and do all of it with a mere 10 watts of pure triode power per channel admittedly (not counting the separate woofer amps!). It all adds up to another award.